Honest, genuine, inclusive conversations about motherhood are rare. Even rarer are the conversations that include and honor women "whose relationships to motherhood are complicated." 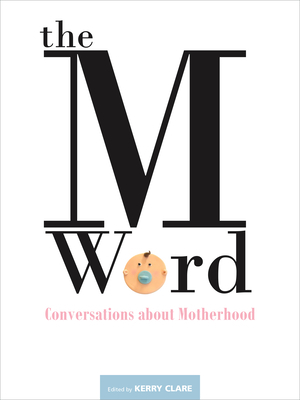 The M Word: Conversations about Motherhood, edited by Kerry Clare, presents a rich, dynamic, occasionally conflicting conversation about motherhood that includes all women. In her introduction, Clare explains the challenges of the motherhood discussion itself. She says that becoming a mother in the traditional sense transforms women, but that transformation itself perpetuates "the insularity of their order (even in spite of a conspicuous lack of a united front), and the knowing glances indicating that outsiders just don't get it." The M Word includes the women that society might say "just don't get it" in her discussion of motherhood: women who have chosen to be child-free, women who have lost children, women who wish they hadn't had children, and women who mother children who are not biologically theirs. For the past ten years, Literary Mama has been the online home for this kind of writing about motherhood: writing that is about the complexities and many faces of motherhood. This anthology is a welcome addition to the growing body of mother-focused writing. Clare, who also has an essay in the anthology, has assembled a diverse group of Canadian writers that includes Carrie Snyder, Michele Landsberg, and Literary Mama contributors Fiona Tinwei Lam and Heidi Reimer. As Clare asserts, the essays, poetry, and illustrations "make clear that women are not as divided … as we might be led to believe." She believes that exploring the meaning of motherhood should not be reserved for women who have birthed and raised their own children. Reading each essay, I am moved to tears and laughter even by women whose circumstances vary widely from my own. In the first essay in the collection, "Truth, Dare, Double Dare," Heather Birrell begins with a strong statement about the "bristling contradictions" of motherhood. "If Motherhood had a slogan," she writes, "it might very well be the double-barreled 'You should have known better' and 'You can't think it through.'" This theme of contradiction and paradox runs throughout the anthology. Birrell describes a challenging time with her first daughter and the anguish of choosing between "the lesser of the evils" when she becomes pregnant accidentally—to have another child or to have an abortion. But she finds that parenting her second daughter is a healing experience. "Becoming parents for the second time," she says, "… allowed us a path to wholeness that had not existed before." Maria Meindl, in her essay "Junior," writes of mothering her own mother until her death: "Nurturing felt like it had been forced on me, and was being given not to the next generation but to the one before." Her anger takes a "solid, monstrous form," and Meindl describes gestating and giving birth to her own "child"—Junior, a fibroid tumor. During the hysterectomy, Meindl’s husband creates a disgusting doll to represent Junior, "the product of my husband's ingenuity and devotion, and of my subversiveness, a legacy from my mother … she would have loved her grandchild." In "Babies in a Dangerous Time: On Choosing To Be Child-Free," Nicole Dixon asserts remaining child-free is itself a maternal act. Without her own children to raise, Dixon is able to nurture herself and, more important, she says, to "mother everyone's mother, Earth." As a mother, it is easy to feel scolded for making the decision to have kids by someone who chooses with such certainty not to, but I found Dixon's piece to be vulnerable and nuanced. In the spirit of caring for our planet, Dixon implores the reader to lose the "us-versus-them mentality" of the child-free and the mothers in order to preserve our ability to make our own choices and to focus together on reducing our harmful impact on the earth. Saleema Nawaz describes navigating the path to becoming a stepmother in her essay "Bananagrams." She describes the meticulous effort she put into developing a relationship with Blythe, her partner's nine-year-old daughter, while her stepdaughter's bipolar and erratic mother taunted her with regular emails: "You are no mother. … You know nothing at all." This biting accusation is not one reserved for stepmothers; it often rises up in the minds of mothers themselves. Even as Nawaz prepares a tap dance routine with Blythe to perform at her wedding to Blythe's father, the child is consumed with concern for whether her mother will be proud of her performance. Nawaz understands the evil stepmother stereotype; in these moments of push-and-pull with Blythe, she feels "how easy it would be to let one's heart grow hard." In her essay "Robin," Man Booker-nominated author Alison Pick recounts how she became a mother. In the first trimester, she experiences the exhaustion of pregnancy, the physical changes, and the morning sickness. She sings a song to her baby: "'My little baby. Oh! My little baby…' It's a lullaby, and a hymn, and a mantra." Trying to conceal her pregnancy during the first trimester, she tells a friend that she isn't pregnant. "As though the baby has heard my remonstrance, when I get home I find blood in my underwear. I gape at it in the same way that I gaped at the pink line on the pregnancy test: something of intimate, immediate consequence that at the same time feels as remote as a star." Her pregnancy is confirmed to be okay by an ultrasound. During the second trimester, Pick is sick with a fever. Stopping to see her midwife before going to the doctor, she again hears the baby's heartbeat. She suddenly feels as if she's going to vomit in the elevator at the doctor's office. Running into the bathroom, she finds her "underwear is soaked with blood. In the crotch, a cylinder of thick red jelly." Her body violently expels the fetus. "The toilet bowl is full of blood, and feces, and something else my eyes flinch away from. I force myself to look back. I want to see my baby, all thirteen weeks of her—her eyelids, her fingerprints, her ears. But from beneath me there's a roar, the automatic toilet flushing. My little baby. Oh! My little baby…." Pick and her husband mourn the loss of their baby, who they name Robin, and Pick reflects that, even after she has another daughter, Robin was the baby that made her a mother. The M Word was an encouragement to me as I celebrated the first anniversary of becoming a mother. I was catching my breath after falling in love and falling pregnant in the span of six months, moving to the suburbs of Washington, D.C., from Manhattan, and surviving one year as a stay-at-home mom with an Ivy League master's degree. My baby girl was one year old, and my world had shrunk and expanded many times over since that Sunday morning 20 months prior when I saw two lines on the pregnancy test and my boyfriend went out for bagels and decaf coffee to celebrate. I was beaming at her first birthday party—proud of my girl and myself and thankful for everything our family had—but I also knew that I had lost a lot when I became a mother and that I had gained a new set of fears and anxieties. Reading The M Word gave me—sleep-deprived and desperate for adult conversation—the prompting and inspiration to do some reflecting on what motherhood meant to me. The text was engaging and, in some ways, challenging to my own tendency to seek safety among like-minded mothers. As I finished reading it, a close friend found out that she was pregnant for the first time. As we celebrated her pregnancy, I hesitated to pass the collection along to her. Superstitious and hoping to protect her, I worried about giving her essays on loss and trauma and regret. But women deserve to hear a conversation about motherhood that is as beautiful and scary and messy and complex as motherhood itself. When her experience of motherhood strays from the accepted stereotype, if it hasn't already, she'll know that she is not alone.